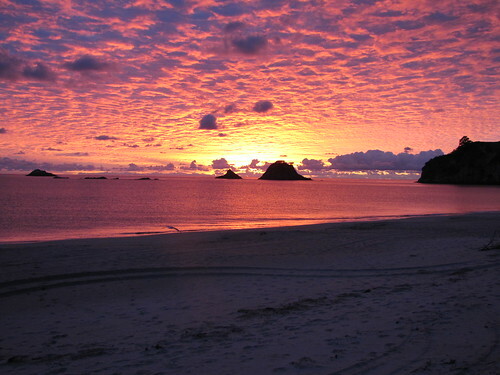 This week’s picture of the week is of a beautiful New Zealand sunset taken by one of our lovely interns. With the weather slowly getting warmer everyone is starting to look forward to long, hot days at the beach. Some of New Zealands best and most famous beaches include Hot Water Beach in the Coromandel- here you can dig a hole in the sand which will fill with naturally hot water! ), Piha beach west of Auckland with its amazing surf, Mission Bay in Auckland, Ocean Beach in Mount Maunganui, and of course Ninety Mile beach at the northernmost point of New Zealand. This entry was posted in INTERNeX, new zealand, Picture of the Week and tagged beach, Hot Water Beach, new zealand, Sunset on October 30, 2012 by INTERNeX New Zealand. This weekend we went to the Coromandel. The Coromandel is a region on the North Island and has some of the best beaches of New Zealand. It is a great option if you are stuck in Auckland for work of your internship and you can easily do it on the weekends. We stayed in Cormandel town. This wasn’t a very special place, but we had an amazing drive all the way to the north of the Coromandel. We saw some incredible rocky beaches and at night we enjoyed the pool at the hostel Anckor Lodge. On Saturday morning we had to get up ridiculously early in order to do a sunrise kayak tour at Hahei beach. Although I was very much against getting up early and the others had to put up with a rather grumpy Lotte, it was very much worth it. We saw an amazing sunrise at Hahei beach while we were waiting for our kayaks. During the kayak tour we went to see Cathedral Cove and to Hoho Rock, one of the most photographed rocks in New Zealand. We also say some stingray’s at Stingray Beach (surprising…) and had a very nice coffee on the beach. The sea was calm, clear and the weather was just perfect. After the kayaking, we relaxed on the beach, as it was one of the first very summery days and afterwards we took off to Hot Water Beach. It is a really strange experience to feel the cold seawater and then suddenly you are almost burning your feet when you are at a ‘hotspot’. Unfortunately, the Germans of our group couldn’t live up to my high expectations of Germans being great at digging holes at the beach and the French tried to conquer the sea as well, we failed miserably in making our own hot pool. All in all it was a great weekend and I can definitely recommend the Coromandel as a destination. At least I stayed true to my nationality and turned fabulously red in the sun! This entry was posted in INTERNeX, new zealand, Travel and tagged auckland, beach, Cathedral Cove, Coromandel, early, Hahei, Hot Water Beach, kayak, new zealand, sunrise, weekend on November 29, 2011 by ixlotte.